Ref. 3970 ?White Gold? Patek Philippe & Cie, Genève, No. 3047308, case No. 4216249, Ref. 3970E. Sold on December, 2004. Very fine and important, astronomic, water-resistant, 18K white gold gentleman's wristwatch with round button chronograph, register, perpetual calendar, moon phases and an 18K white gold Patek Philippe deployant clasp. Accompanied by a mahogany fitted box, spare solid back, setting pin and a certificate of origin. C. Three-body, solid, polished, transparent and screwed-down transparent case-back, concave bezel, fluted lugs, sapphire crystals. D. Satiné silver with applied faceted bâton indexes, subsidiary dials for the seconds and the 30-minute register, the days of the month, the 24 hours and the leap year, aperture for the days of the week, the months and the moon phases. White gold "Bâton" hands. M. Cal. CH 27-70 Q stamped with the Geneva Quality Hallmark, rhodium-plated, "fausses-côtes" decoration, 24 jewels, straight line lever escapement, Gyromax balance adjusted to heat, cold, isochronism and 8 positions, shock-absorber, self compensating free-sprung Breguet balance spring. Dial, case and movement signed. Diam. 36 mm. Thickness 13 mm. C. Three-body, solid, polished, transparent and screwed-down transparent case-back, concave bezel, fluted lugs, sapphire crystals. D. Satiné silver with applied faceted bâton indexes, subsidiary dials for the seconds and the 30-minute register, the days of the month, the 24 hours and the leap year, aperture for the days of the week, the months and the moon phases. White gold "Bâton" hands. M. Cal. CH 27-70 Q stamped with the Geneva Quality Hallmark, rhodium-plated, "fausses-côtes" decoration, 24 jewels, straight line lever escapement, Gyromax balance adjusted to heat, cold, isochronism and 8 positions, shock-absorber, self compensating free-sprung Breguet balance spring. Dial, case and movement signed. Diam. 36 mm. Thickness 13 mm. 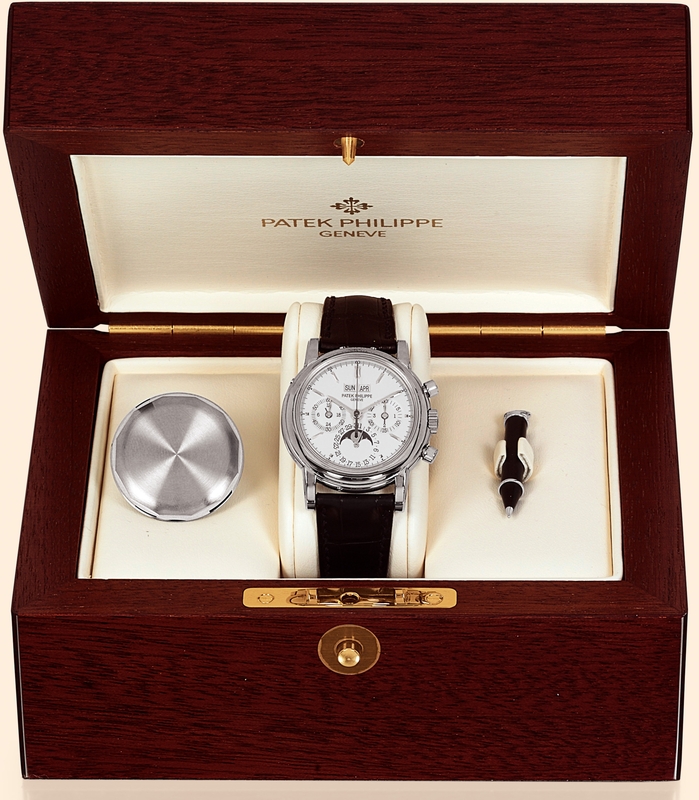 The 3970 was introduced, for Patek Philippe?s 150th anniversary, to replace the successful model Ref. 2499, which had been produced from 1951 to 1985. Thanks to the explosive popularity of collecting vintage Patek Philippe wristwatches during the early 1980s, collectors had discovered the extreme rarity and enduring value associated with these timepieces. In a rare breach of Patek?s legendary secrecy, it was discovered that fewer than 400 pieces of Ref. 2499 timepieces, including the last evolution, the Ref. 2499/100, had been manufactured during the model?s entire production. Patek Philippe also sensed the need for a more modern design of its flagship model, which had only undergone minor design revisions over a 30 year period. Antiquorum?s 1989 thematic auction ?The Art of Patek Philippe?, signaled the start of the company?s growing popularity among watch enthusiasts. Although Patek Philippe had always cultivated a discerning, loyal clientele, it was never a high profile brand. That changed dramatically as affluent individuals began purchasing modern Patek Philippe wristwatches to wear and enjoy. Consequently, thanks to the successful market of the late 1980s, the Ref. 3970 became a ?best seller? for Patek Philippe. Amazingly enough, only a handful of collectors recognized the true scarcity of certain variations for this watch, in particular, the endless possibilities for collecting Ref. 3970 by dial variation or different styled indexes and/ or hands. For a number of years. It was possible for astute collectors to acquire unusual and extremely rare Ref. 3970s for a very reasonable price. Since that time, however, several factors have contributed to a sudden and sharp (but not entirely surprising) rise in value for this watch. The Ref. 3970 is now truly considered a classic by collectors, following in the footsteps of its predecessors Ref. 1518, Ref. 2499, and Ref. 2499/100. They have become virtually unattainable to all but the wealthiest and most patient individuals. Obviously, the next best choice will be a Ref. 5970. Hopefully, this note will shed some light on the different variations of the Ref. 3970 and help to better define its value, while clearing up some misconceptions. We can distinguish three series in the production of Ref. 3970. We define a ?series? by the variation in case designs or features, whereas we designate dial variations as being ?first generation,? ?second generation,? and so on. As a general rule, the Ref. 3970 was produced in 18K white, rose, yellow gold, and platinum, with the latter being the rarest variation, therefore always the most expensive. The first series of Ref. 3970 featured the 36 mm. case with a snap-on case back. This particular model should be considered extremely rare since it was only produced in fewer than 100 examples from 1986. The second series of Ref. 3970 also featured the 36 mm. case, but with a solid screw back. After the second series, Patek Philippe introduced the Ref. 3971, similar in design to the 3970 but with a sapphire crystal display screw back. The company also received many special order requests to make the 3970 with an additional sapphire crystal display screw back. The third series is known as Ref. 3970E (E stands for etanche which means waterproof) and was housed in the same 36 mm. case. Because of numerous special order requests, Patek Philippe took the opportunity to feature the 3970E with both a solid gold screw back and a sapphire crystal display screw back. This is probably the most common of the three series. The earliest examples of the first series of Ref. 3970/2 with 36 mm. case featured a gold bracelet fixed to the traditional case; subsequently an integrated bracelet was used. A small number of early Ref. 3970/2 watches were sold with a solid snap back. Such watches should be considered quite rare. The remainder of Ref. 3970/2 will be encountered with the more common screw back. Finally, in the first and second series, the watches were generally sold with tang buckles, whereas in the third series (Ref. 3970E), after 1997, a deployant buckle was added. When Ref. 3970 was first introduced, Patek Philippe would occasionally accommodate a special customer?s request to order a custom dial. This often took place after the sale was concluded and resulted in some interesting and extremely rare case/dial combinations. As time went on, it became increasingly rare that the company accommodated requests for special dials. Consequently, any interesting or unusual dial variation can add tremendously to the value of the Ref. 3970 and Ref. 3971. Let us now examine the two generations of standard dials: The first generation dial of these references was offered in two-tone silver (very subtle) with bâton markers. Generally speaking, the printing will be lighter on earlier dials, and the numbers on the date wheel will feature a serif font. The dials may be variously described as satiné silver or opaline silver. The second generation dial is silver (not two-tone as in the first generation) and features the same bâton markers, but the font used on the dial will be slightly different, and the date wheel will be sans serif. The third generation dial is silver, but with darker printing and triangular markers. The platinum and 18K white gold Ref. 3970s were also available with a black dial, and/or has diamond markers or white gold/platinum indices (the latter being much rarer). There are a very small number of ref. 3970?s in 18K yellow gold with silver diamond dials; such watches are extremely rare. Patek is also known to have produced diamond dials in both salmon and white. Again, Ref. 3970 with custom dials such as the ones described is exceptionally rare. During production of the Ref. 3970, the hands of the watch changed slightly. The earlier models (first generation) had leaf hands, whereas later models (second generation) had bâton hands. It is not known when this change took place. One extremely rare variation on the Ref. 3970 has been seen with dauphine hands. The Ref. 3970 was fitted with the 27-70 caliber throughout its entire production. Although there are no variations in the caliber itself, the number system did change during the mid 1990s when it went from a six digit serial number beginning with 875 to a seven digit serial number beginning with 304. Although it has less of an effect on value than dial or case variations, an earlier serial number is generally considered more desirable than a later one. This Ref. was no longer featured in the catalogues as of 2005.